A study carried out by the National Sun Yat-sen University and National Central University of Taiwan has concluded that Hydropower generation is likely to increase climate change more than fossil fuel power stations. This surprising result runs contrary to the popular belief that hydropower is one of the cleanest forms of electricity generation, but the research carried out across South East Asia agrees with previous research carried out in Brazil and other locations. Large scale hydro-electricity generation depends on the building of dams and creation of reservoirs. Water trapped in a reservoir has only one means of escape to continue its journey downstream – passing through a generator at high pressure and making electricity. Unfortunately while the water all gets through eventually, organic matter (plants and plankton etc) often does not and sinks to the bottom of the reservoir where it is trapped in silt and mud in the dark. The net result of this is the release of vast amounts of harmful methane and nitrous oxide into the atmosphere. The hotter the climate at the location of the dam, the worse the effect. One hydroelectric plant in Brazil in 1990 had more effect on global warming than the sum of 54 natural gas power stations generating the same amount of power. While releasing carbon dioxide into the atmosphere is believed to lead to climate change – i.e. global warming – methane and nitrous oxide are far worse. Methane is 20 times more harmful, and nitrous oxide 200 times more harmful than CO2. Every ton of nitrous oxide released into the atmosphere is as bad as 200 tons of carbon dioxide. Basically speaking hydro-electric reservoirs convert CO2 from the atmosphere into dissolved methane and nitrous oxide which is released back into the atmosphere as the water passes through the generator. 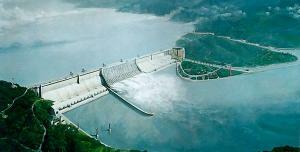 The problem discussed above only exists when we have a dam across a river creating an artificial reservoir. This is the way that all major hydro-electric power stations work. Such dams have a large number of other environmental problems since they involve the flooding of vast swathes of land destroying trees, plants, wildlife and their habitats. Smaller scale hydropower projects are often created as run of river and have no dams. Their environmental impact is minimal yet large amounts of energy can still be extracted from the water thanks to the over 90% efficiency of modern hydro turbine generators. Across the developing world there are many hundreds of such projects (Pico Hydro) each generating 0.2-5kW of clean electricity for local populations. More information about this research can be found in the following (subscribers only) article in Nature: Methane quashes green credentials of hydropower. Another interesting article from a 2005 edition of New Scientist is Hydroelectric power’s dirty secret revealed in which the initial flooding of land caused by damming was also exposed as a cause of carbon dioxide and methane release into the atmosphere.